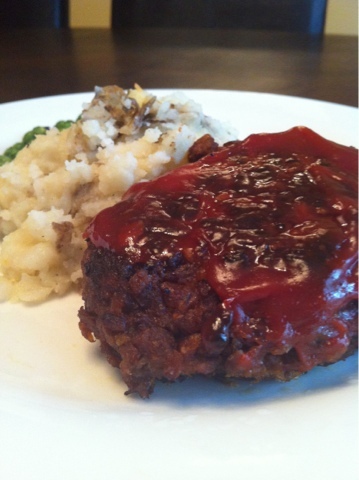 Last night’s dinner was vegan meatloaf, mashed potatoes, and peas. I was in the mood for some good old fashioned comfort food and this was perfect! Obviously, you could substitute ground beef for the vegan meat, but, really, why would you want to? 2. In a large bowl, add all ingredients (except the olive oil) and mix well. I just use my hands to really get in there and blend it all together. 3. Divide into four loaves. 4. In a large skillet, heat olive oil over medium high. Place loaves in skillet and cook until nicely browned, about 2 minutes or so on each side. 5. Remove from skillet and place in a prepared 8 1/2 x 11 baking dish. 6. Bake 20 minutes, or until internal temperature reaches 160*. 7. Top with a little extra ketchup and put back in the oven for another five minutes. 8. Remove from oven and serve immediately. This is also very good reheated. I just devoured the leftovers for lunch today!